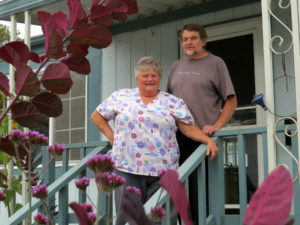 I moved to Humboldt County with my developmentally disabled sister and blind husband in 1996. I had been a technical analyst on the Space Shuttle Main Engines. As the program wound down I was laid off. At 50 years of age it was not likely that I would find another job and so I decided to go for my life’s dream and get a bachelor’s degree at Humboldt State University. When we arrived, we realized how bad the housing situation was. As a university town, all the available rentals were well worn by the students and were priced as if many people would be paying the rent. We could not afford a rental with our limited income. At the time the local manufactured housing sales office had a promotion. With a $500 down payment we could get into a house of our own. My husband and I thought that we could make the payments on the house with my company-sponsored retirement. We also considered that, at our advanced age, if anything were to happen to one of us, the other would have enough income (after the house was paid off) to at least have a place to live. The first several years were comfortable. Our landowner was conservative with his rent increases and with minor budget adjustments we could keep up. Then came the Wall Street crash of 2008. What retirement I had invested disappeared and all the rules changed. Investors revised their strategies and began purchasing manufactured home parks. They purchased the land knowing that, unlike apartments, there was minimal maintenance and that the renters did not have an option to move as rents increased. The investors had a captive audience. My community continued in peaceful oblivion until two of our local parks were purchased by a REIT. Upon purchase, rents increased significantly. That is when, in conversations with my peers, I realized how desperate some of the seniors were. Given a few more years I could be in the same place. And, what’s more, it is so unjust that people that have contributed to the society all their lives and have played by the rules should be taken advantage of by a few wealthy investors. My sense of right and wrong was enraged and I began to do something about it. I joined with local organizers and when repeated requests to our local elected officials were ignored, we began collecting signatures for a ballot initiative. In this intervening time, my landlord began the first of a series of significant rent increases. My first increase was 9%. On top of the increases, when he realized that I was active in the initiative campaign, I was told that I had to remove my vegetable garden that had been on community land for over 15 years. That affected several other residents as they ate from my garden too. There was no recourse but to comply. A fight would engender even more reprisals and the civil laws that would protect me are carried out in a court room presided over by landowner judges who are not familiar with manufactured housing issues. Since I have a friend that attempted to use the court system, I know how biased they are. I come to you in a state of disillusionment. The system is no longer working for the average person. Income disparities have increased markedly. My Social Security will go up less than five dollars a month next year. That is after it didn’t go up at all the year before. Rent for the piece of land that I park my house on went up 18%, my sewer rates will double over the next two years. The PUC gave my utility company permission to increase my electricity by 19%. I am paying over $300 a month for health insurance and I am 70 years old. I have no hope of finding a job to supplement my income even if my health could survive re-entry into the labor force. I am not alone in my struggle to survive in this new world. The American people are in active rebellion because they too perceive the injustices of the system. So now, I ask you to look into your heart and find the humanity. We are fellow humans that contributed to this system that you are doing so well by. Is it right that seniors and low income people that have worked, payed taxes and played by the rules should pay so high a price while those with so much take even more?